Patricia MacLachlan writes as though she's been here before. She has a perspective on life that is just sensational. Welcome to Deer Island where Jake and Boots have made a home for years and years. Theo and Louisa, their two grandchildren, are coming to stay with them while their parents are off researching and photographing birds. What happens over the next few weeks is what we call magic. When Louisa first gets to the island she tells her grandmother that she hates change. Boots, being someone who knows everything, wisely tells Louisa that something just might happen to make her change her mind about change. It only takes a few hours before Louisa walks out into her grandfather's garage and discovers just what that something is. His name is George and he likes how her hair tumbles. That's the first time Louisa has ever looked in the mirror and seen beautiful. Talk about magic. Life on the island draws people together to brush up against each other and share bits and pieces of themselves and that includes the dogs and eventually three sheep. What can weeks on an island teach you? What can finding someone who sees your beauty change in you? Change isn't going anywhere so it's a pretty gorgeous and miraculous lesson when Boots teaches Louisa and Theo to look forward to it. As always, this story that was born of the enormous heart and all-knowing soul of Patricia MacLachlan, is touching and leaves you feeling better about yourself and the amazing gift we all share in...life. 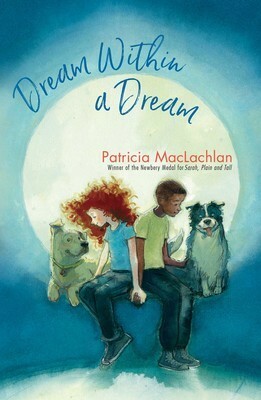 ********* A young girl finds herself—and so much more—during a summer stay with her grandparents in this tender novel from Newbery Award–winning author Patricia MacLachlan.